I woke up at 6:15am, and breakfast consisted of a porridge, banana and bowl of berries. I caught the central line from Chigwell at 7:44am and alighted from Leyton underground station. This was great for me, as the entire commute took a mere 20 minutes! I arrived at the race village in Hackney Marshes some 15 minutes later, after a short walk. Unfortunately, the queues for the portaloos were long. Very long! It was no surprise to see huge numbers of runners flocking to the bushes to answer natures call. This was quite disappointing. I engaged in a pre-race warm-up and made my way to the starting pens around 8:50am, and still saw very long queues for the portaloos. 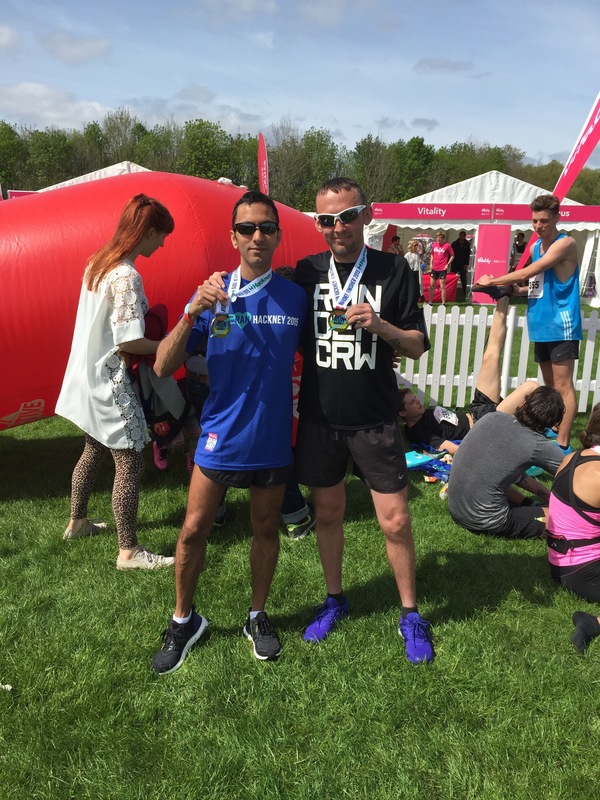 It was also great to catch-up with Arron Browne, a fellow East London Runner (ELR) team mate before the race. I lined up in the 1:15-1:30 pen, which was pretty crowded, hoping to run hard and ‘maybe’, just maybe, run under 1:23:39 (last PB). I had a disappointing couple of early spring half marathons, finishing Silverstone and Hampton Court in 1:24:50 and 1:25:47, respectively. Given the conditions on both days, I performed as well as I could, but it would have been nice to see some improvement. But I digress. The race began promptly and 9am, and I crossed over the start line ~19 seconds later, activating my Garmin. The first 1km was a little congested, and it took me some time to find my pace and stride. With a lot of runners around me, there was some dodging and weaving, but the crowd thinned out pretty soon after. For most of the run thereafter, I had plenty of room to run comfortably, and even found myself completely alone for some stretches. I was trying to ensure <3:58 minute km splits, to keep on track for a PB. My trusty Garmin was loyally chiming at every 1km split, alerting me to the previous km’s pace. I was pleased to be on track for most of the run, with a few exceptions where I marginally slowed down for some undulations. The route, as last year, was most definitely not pancake flat! Fortunately, no inclines were too sinister or long-lasting. I ran comfortably hard, reaching 10km in 38:29. 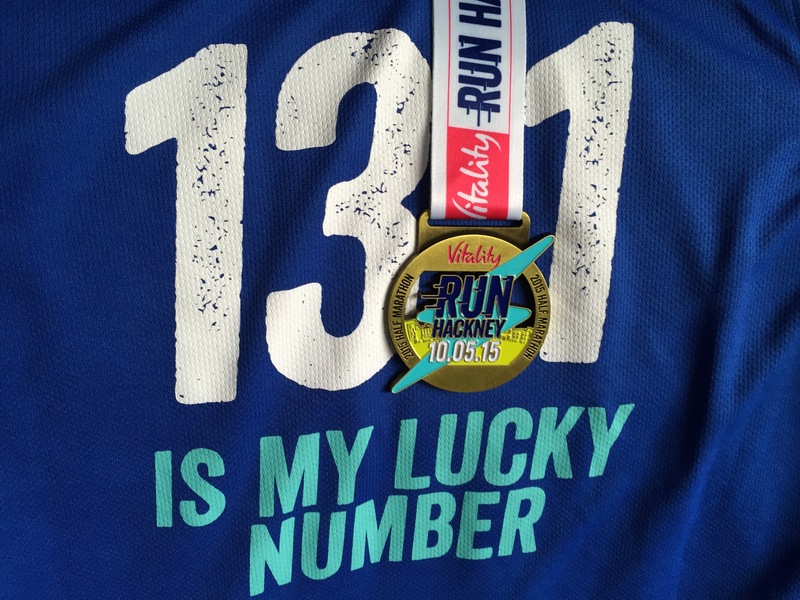 This was quite interesting, as my current PB for a 10k race is 38:18. This gave me huge confidence that I should be able to run under 38 minutes at the Bupa 10,000 in 2 weeks time. I continued to push through, and felt great until the 17km mark. After this point, I began to feel a little tired, and maintaining my pace took more effort. I knew I was on track for a PB, albeit a minor one, and this desire was enough to keep me going! The crowd support helped with this, who were absolutely fantastic. Race makers at the water aid stations were also supportive, and I really appreciated their efforts today. Just before the 12 mile mark, I felt a crampy twinge at the top of my calf muscles. This scared me a little, as I really was not in a position to slow down, or in a worst case scenario, stop! I slightly lowered my pace, resulting in the loss of a few seconds for the final few kms. I continued to push through this, and just after the 20km point, once again began to up my pace. I felt okay, but a little nervous that the cramp may return with a vengeance, and could see the end in sight now. 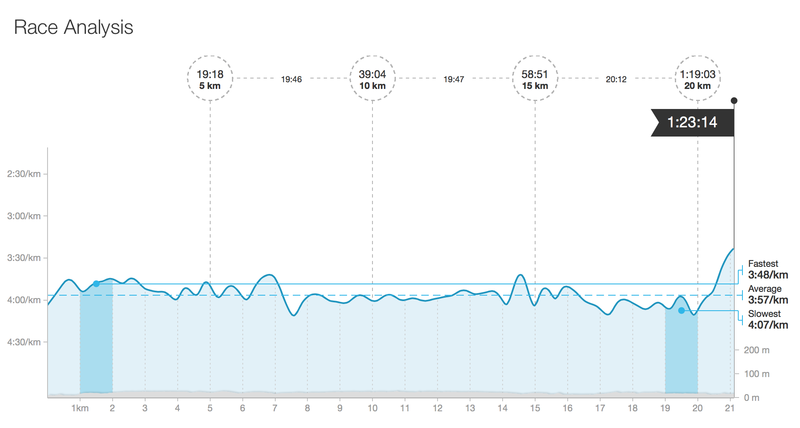 I took another peek at my Garmin, and recall seeing just over a minute before I loose my PB. The end was in sight now! With the finish line straight ahead of me, I went all out! Okay, this was not a ‘sprint finish’, which I normally do at the end of a half, but a solid effort with a <3:20/km pace. I finally crossed the finish line with chip time of 1:23:14, in 104th position (out of ~10,300 finishers). Personal best! So a PB by 25 seconds, and not the ‘sub’-1:23 I wanted, but a PB is still a PB! Oh, and finishing in the top 1% was also nice!! I met a fellow ELR, the very kind Muhammad Iqbal, at the finish who congratulated me on my performance today. I then headed out of the pens before being handed a medal, goody bag and Technical T-shirt. It was also nice to meet another fellow ELR team-mate, Stuart Kelly, who also had a smashing race, finishing in 1:24:10. As with last years event, I headed for a quick complimentary massage and got those calf muscles back in order! Finally before leaving the race village, I had a quick chat with Mark Parkinson, a great runner who I am hoping to smash the Bupa 10,000 with. So, onto final conclusions. 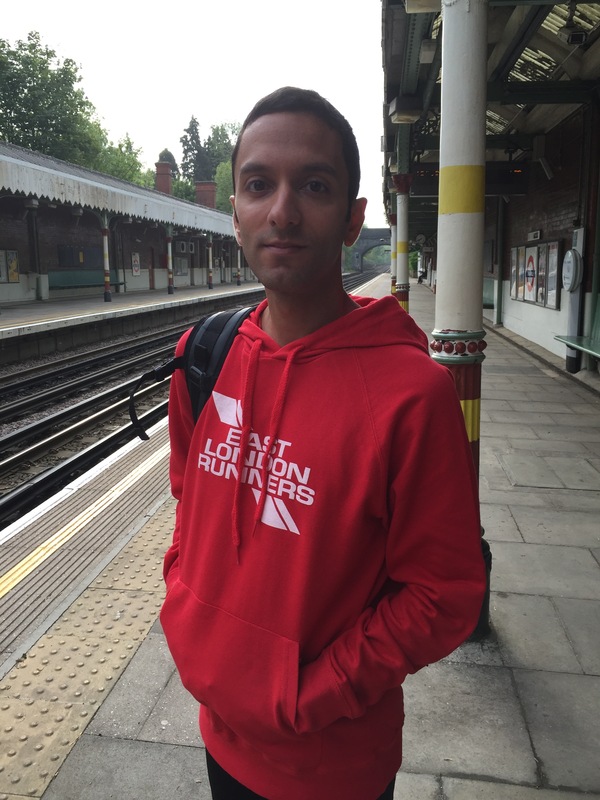 Run Hackney 2015 was bigger and better in 2015, improving on some of the issues with 2014. The medal was much flashier and the Tech T-shirt is a welcome addition. I personally love cherishing memories of all my races, and feel that a memento like a quality garment is a nice way to do so. 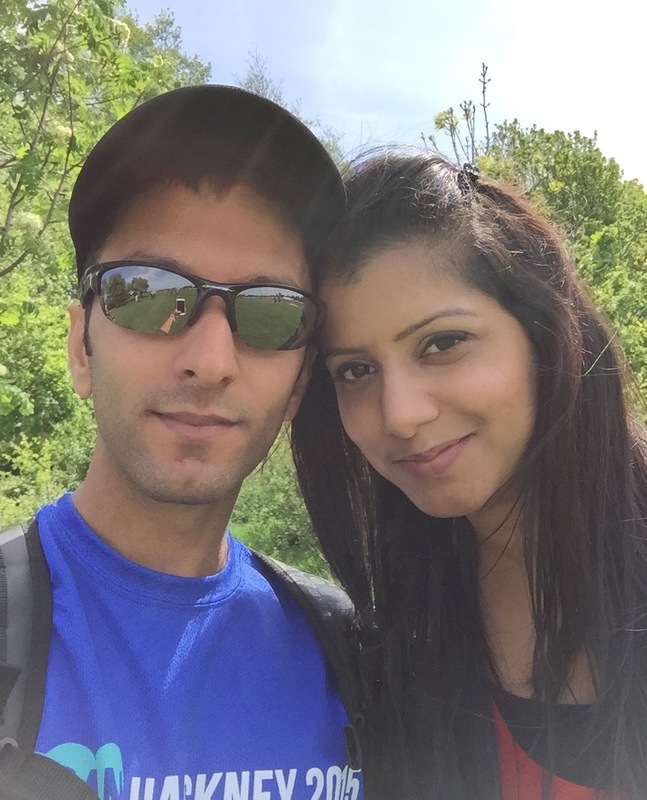 I would also like to say thank-you to Sania for all her efforts with my running and races. Getting up at silly hours in the morning, coming to my races and standing in the crowds cheering all the runners and then making a race video for me is much appreciated! Now I am feeling injury free and strong again, I am hoping to make some changes to my training to really push for those continued PBs. On a closing note, I will definitely recommend Run Hackney to anyone looking to complete a quality half marathon race. Nice recap of the race. I’ve just entered this year’s race and it’s nice to see everybody seems to enjoy it. 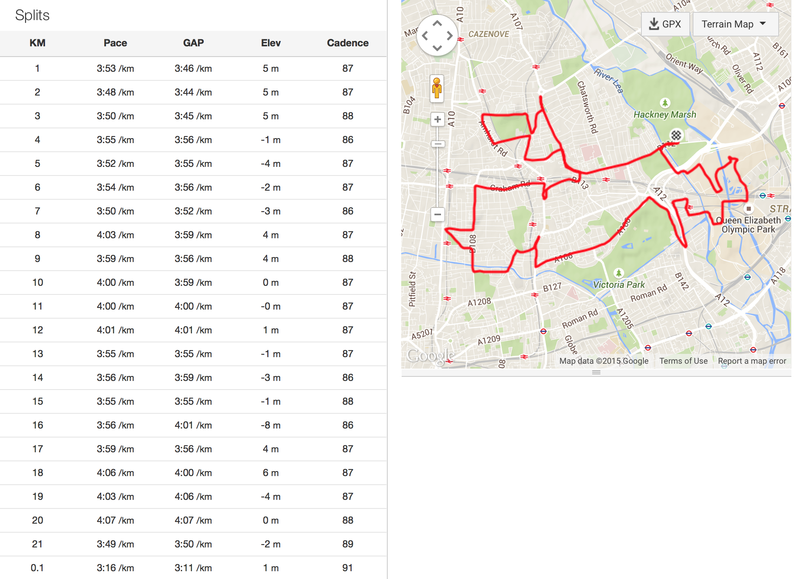 It will be my first organised run in London.